Astronomie - Was ist, wenn außerirdische Beobachter uns rufen, aber niemand hört? Showcased at the center of this NASA/ESA Hubble Space Telescope image is an emission-line star known as IRAS 12196-6300. Located just under 2,300 light-years from Earth, this star displays prominent emission lines, meaning that the star’s light, dispersed into a spectrum, shows up as a rainbow of colors marked with a characteristic pattern of dark and bright lines. The characteristics of these lines, when compared to the “fingerprints” left by particular atoms and molecules, can be used to reveal IRAS 12196-6300’s chemical composition. Under 10 million years old and not yet burning hydrogen at its core, unlike the sun, this star is still in its infancy. 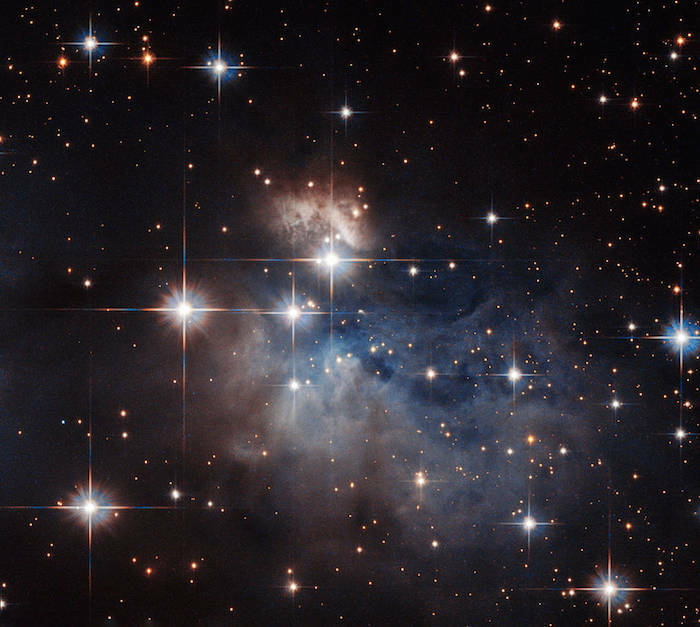 Further evidence of IRAS 12196-6300’s youth is provided by the presence of reflection nebulae. These hazy clouds, pictured floating above and below IRAS 12196-6300, are created when light from a star reflects off a high concentration of nearby dust, such as the dusty material still remaining from IRAS 12196-6300’s formation.